New research for National Bookstart Day has found that just 36 per cent of parents regularly use nursery rhymes with their children, with almost a quarter saying that they have never sung a nursery rhyme with their child. Younger parents claim that nursery rhymes are ‘too old-fashioned’ to interest their children, with 20 per cent saying that the traditional songs and rhymes are not educational. Parents living in the Midlands and Wales most frequently used rhymes, with the parents surveyed in Northern Ireland least likely to use them. The survey also found a lack of knowledge of traditional rhymes among younger people, with just 58 per cent of 16- to 24-year-olds knowing all the words to ‘Little Miss Muffet’. The survey was carried out by reading charity, Booktrust, in preparation for National Bookstart Day on Friday 9 October, which this year has the theme ‘My Favourite Rhyme’. National Bookstart Day celebrates the Bookstart programme which gives free books to every child in the UK and encourages sharing books and rhymes with children as early as possible. Over 2,500 people took part in the survey, which found that the nation’s favourite nursery rhyme is ‘Twinkle Twinkle Little Star’. 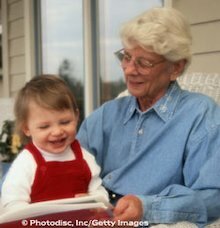 Sixty-three per cent of parents who used rhymes with their children said that they did so because they made children laugh, while 18 per cent used them instead of a bedtime story. To help parents develop a love of nursery rhymes, and give them the confidence to share them with their children, Bookstart will be producing and distributing one million books containing the nation’s top eight rhymes. Thousands of families will be invited to take part in activities across the UK, including Bookstart Rhymetimes, appearances from the Bookstart Bear and song and storytelling sessions.